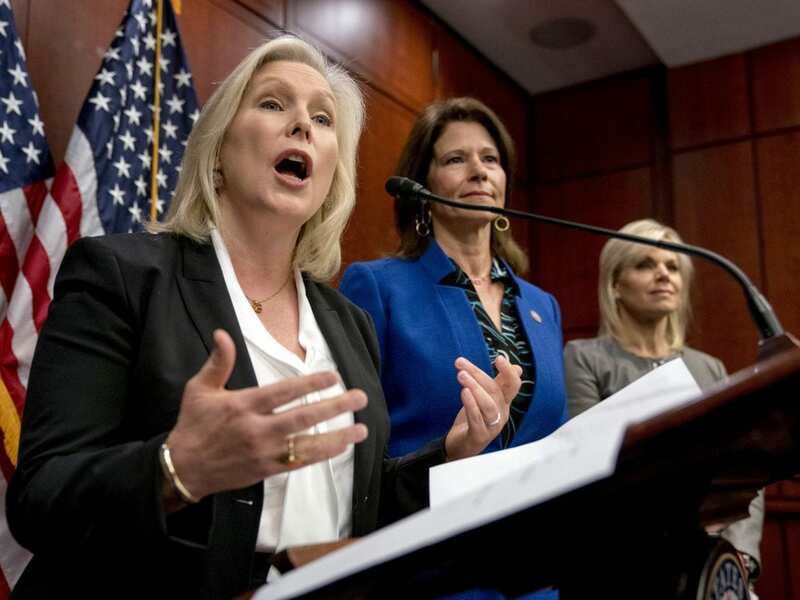 From left, Sen. Kirsten Gillibrand, D-N.Y., accompanied by Rep. Cheri Bustos, D-Ill., and former Fox News host Gretchen Carlson, speaks at a news conference where she and other members of congress introduce legislation to curb sexual harassment in the workplace. “The process that somebody has to go through to file a claim is really kind of stacked against the claimant,” Republican Rep. Bradley Byrne of Alabama — himself a former employment law lawyer — told NPR in January. Filing an official complaint about harassment on the Hill involves a multistep dispute resolution process that can stretch out for months, as described on the congressional Office of Compliance website. A staffer must first request counseling and that counseling period “normally lasts for 30 days,” according to the Office of Compliance. Then, the staffer must request mediation, which also usually lasts 30 days. If that mediation doesn’t resolve things, the staffer then can proceed with a lawsuit or have an administrative hearing, but can only do so 30 to 90 days after the mediation ends.